For about $20,000, the Dodge Grand Caravan AVP is one of the biggest values in the automotive universe--except it doesn't come with a rearview camera, Bluetooth, or Stow 'N Go seating, three features we deem must-haves. 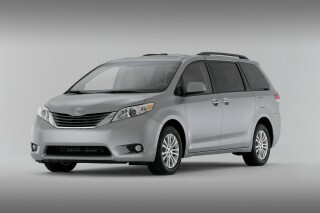 You'll fare better with the SXT for pre-packaged minivan ordering ease. The Dodge Grand Caravan has been a fixture in the Chrysler brand's lineup since the whole idea of the minivan took to the streets. Now, a few decades later, it's nearing the end of the road. 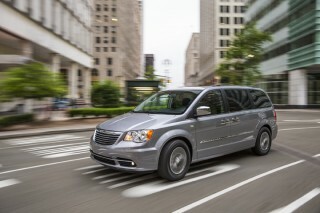 The twin to the Chrysler Town & Country will be dropped from the Dodge lineup after 2015, as the company clarifies its product lineup. The latest Grand Caravan still is one of the most functional vehicles you can buy. With a base price of about $20,000, the most you can spend on a Grand Caravan is a little more than $30,000, for which you get the most useful cabin and the best-executed infotainment features in the segment. That's saying a lot, since the Caravan competes with the well-mannered Honda Odyssey and the big, all-weather-capable Toyota Sienna. 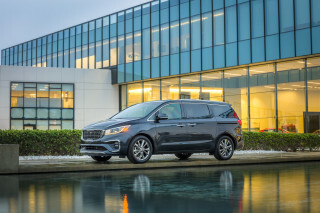 The Nissan Quest and Mazda 5 and reborn Kia Sedona should also be on shopping lists, though none come as well-equipped at the Dodge's bargain prices. 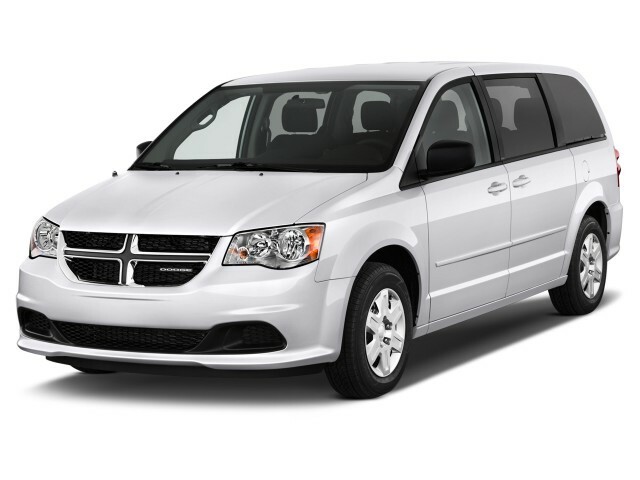 With a round of running changes under its hood and on its nose since the 2011 model year, the Dodge Grand Caravan returns for 2014 with its essential goodness intact. It's still one of the best choices for carrying up to eight passengers--and for keeping them entertained along the way. Minivans are all about utility, and carrying the maximum cargo and number of people, which makes Chrysler's fold-away second- and third-row seats a brilliant idea. 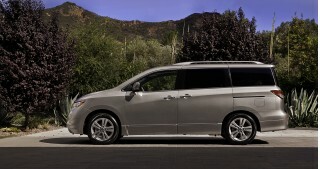 The Nissan Quest used to have the same arrangement, but it's abandoned the setup for a fold-away third-row seat and fixed second-row seats; the Odyssey and Sienna have sliding, fold-down second-row seats and fold-away third row seats. In the Grand Caravan, the seats fold flat into the floor, or stay in position, with in-floor storage bins holding their place. To accommodate the disappearing act, the Chrysler seats are thinner and flatter--but we've never heard a kid complain about the seat comfort, and Costco boxes don't exactly complain, either. We've taken our turn in the Stow 'N Go seats without complaint. The Grand Caravan's third-row seat has a power-fold option, too, as do its side doors and its tailgate, and converting the space to pure cargo hold takes just seconds. Minivans also must be safe, and excellent crash-test scores are the Grand Caravan's calling card. The IIHS calls it a Top Safety Pick, and every one comes with curtain airbags and stability control. A rearview camera, Bluetooth, and blind-spot monitors are available, and the power sliding doors have gentle closure that rebounds if obstruction is detected. A single drivetrain configuration puts all Grand Caravans on performance par. The engine's a 3.6-liter V-6, with 283 horsepower, coupled to a six-speed automatic transmission, with power shipped to the front wheels only--all-wheel drive left the lineup after the 2007 model year. Smoother here than in most other Chrysler vehicles, the powertrain has just a touch of the V-6 groans, and an abundance of strong low- and mid-range power. Steering and ride are off the mark set by the Honda and the leaner Nissan Quest, but the Grand Caravan feels composed enough at speed. The Grand Caravan bounds over any series of small bumps; the damping really should and could be better. The Grand Caravan stays true to the boxy styling theme that it's worn for most of its life, save for the 1996-2007 model years. We liked those egg-shaped vans, but the functional outline of today's minivan pays dividends in its light, airy interior. It's slab-sided and relatively plain compared to the lightning-bolted Odyssey and the low-nosed Sienna, but the Grand Caravan has a glassy cabin and very good outward visibility. The interior's now up to grade, too--in 2011, Dodge replaced the plasticky cabin trim from the 2008-2010 model year with much more appealing textures, for a much better impression of quality. A new value edition introduced last year brought the Grand Caravan base price down to about $20,000, an incredible bargain for the class. For a well-equipped version with satellite radio and other luxuries, the price is still less than $30,000. If you choose, the Grand Caravan can be ushered into the pricing stratosphere with a cavalcade of electronic goodies that's second only to those in the Ford Flex. Top models can be equipped with a media hard drive, navigation, satellite radio, and Bluetooth—even a Blu-Ray DVD entertainment system with USB ports for charging, or on-board data service via Chrysler's UConnect Web. The most efficient minivan shape isn't always the best-looking one, but Dodge softens the Grand Caravan just enough for our taste. 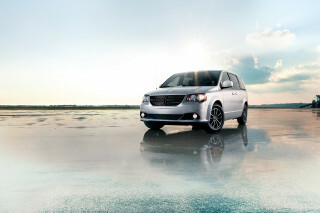 Or, at least that's the message Dodge seemed to send when it brought the boxy Grand Caravan back to the market in 2008. The last generation of minivans had softer lines that made them feel almost voluptuous, so it came as a surprise when the reskinned Grand Caravan returned to pay its respects to the vans of the early 1990s. While the Honda Odyssey has earned an increasingly racy profile, and Toyota's Sienna has found itself with a more and more aerodynamic nose, Dodge has stepped back to a more rectangular design. If anything, it says exactly what the Grand Caravan is all about–a functional family-hauler with less varnish than utility. That's not to say it looks downright cheap–though it might have between 2008-2010–but it doesn't look quite as modern as the up-and-coming Japanese competition. There are a few small touches that work well with the boxy body, though. The crosshair grille has been beefed up and the headlights are suggestively rounded, and the R/T model looks a little more like the kind of car the typical Dodge shopper would want. There are also LED taillights, a la the Charger, but that's about the only similarity shared with Dodge's sportier cars. Moving inside through the front-hinged doors, the Caravan's dash and door panels have bailed on the grainy plastics of the 2008-2010 model years, for something more substantial. From the sliding side doors back, not much has changed—it's still crayon-and-vomit-proof—but facing the senior family members is an uncluttered, upgraded dash with better materials all around. The detail that snags: the Caravan's chintzy base cloth upholstery, which feels a little fuzzy, and looks a bit like something out of a 1980s Korean car. Leather's worth the upgrade, but it's an option only on the top two trim packages. Gutsy acceleration and quick steering are one facet of the Grand Caravan's performance; a boundy ride and plenty of lean are another. Gone are the days of multiple powertrain options for the Chrysler minivans–the current Grand Caravan has only one engine, one drive configuration, and one transmission available. All Grand Caravans are powered by Chrysler's 3.6-liter "Pentastar" V-6, which produces 283 horsepower. This engine feels torquey and responsive at low and mid-range speeds, and while it's not necessarily the smoothest engine on the market–there's a little bit of exhaust and vibration on hard acceleration–it's notably better than any engine that's come before it. It's 86 horsepower up on the the 3.8-liter V-6 it replaced, and it produces 30 hp more than the old 4.0-liter. It's quick in a straight line, and fuel economy is still better than average at 17/25 mpg, thanks to its six-speed automatic transmission. The result is predictable handling and strong, confident acceleration. While it's not quite as refined as the Toyota Sienna or the Honda Odyssey, it's not too far off the mark, and the Grand Caravan can easily be considered pleasant behind the wheel. Handling is nothing remarkable, but for a nearly 300-horsepower vehicle, there's very little scrambling going on through the Caravan's front wheels. (All-wheel drive? It's been gone from the lineup since 2008.) Ride quality is almost cushy compared to rival vans, but even with retuned shocks, the Caravan bounds more than it needs to over strings of low bumps. It's more content to smother, which makes its handling a neat metaphor for the kind of parenting minivans are built to support. 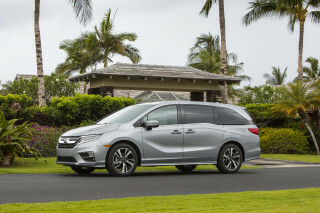 There's an R/T version that comes closer to the buttoned-down feel of a Honda Odyssey, thanks to distinct suspension tuning, though the Odyssey's steering feel still gets more kudos from our editors, as does its overall road feel. The Grand Caravan has great interior space and the most flexible seating system in the minivan category; some finishes are still plasticky. The Dodge Grand Caravan has one of the most inventive seating systems in the business, even if the Swivel 'N Go picnic-table option is no longer available. There's seating for up to eight in the Grand Caravan, and adults will feel comfortable in the front five seats without complaint. The front bucket seats provide plenty of space in every direction, though the seat cushions could use a little more support to complement their very soft and spongy texture. There's also ample room in the second row of seats, both in base bench- and optional captain's chairs. The bench seats offer in-floor storage bins, and models individual seats have fold-away units that tuck into those bins when they're not needed, leaving a flat load floor. 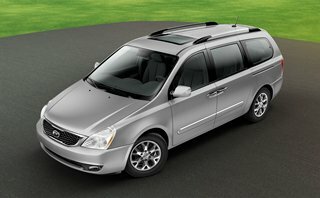 With exception to the Chrysler Town & Country, no other new minivan offers the same level of practicality. These "Stow 'N Go" seats have flatter cushions than many other vans on the market, but that comes as part of the added utility of being able to tuck them away with the flip of a lever. When they're in use, the storage bins are useful as covered stowage for large amounts of cargo, before you even open the rear hatch of the car. The third row in the Grand Caravan is best suited for kids, but smaller adults can fit in a pinch. It also folds away–either manually or with the optional power-folding system–to create more cargo space when needed. We miss the pop-up picnic table and Swivel 'N Go second-row seats, but the rest of the excellent space remains intact. We'd also opt for the movable, and removable, "super console" that's on the Dodge's options list. It adds many cubic inches of covered space between the seats--it's a virtual Tupperware for music players, spare change, even the odd French fry gone rogue. On a meta level, it's a box within a box. What's not to love about that? A host of advanced safety options are welcome; the NHTSA's four-star rating puts the Dodge just shy of the best in class. The Dodge Grand Caravan receives excellent crash ratings from both agencies, despite not being quite as safe as some of its alternatives. The National Highway Traffic Safety Administration (NHTSA) gives the Grand Caravan four stars overall, with a four-star score for front-impact protection and rollover resistance, and a five-star rating for side-impact protection. The Grand Caravan is outdone only by the Honda Odyssey, which earns five stars from the NHTSA. Meanwhile, the Insurance Institute for Highway Safety (IIHS) says the Grand Caravan earns "good" scores for front, side, and roof-strength tests--but rule changes mean that is no longer automatically a Top Safety Pick, since the van hasn't been subjected to the IIHS' new small-overlap test. A bundle of safety options includes parking sensors, a rearview camera, blind-spot monitors and automatic headlights. And thanks to the boxy design and vast greenhouse, outward visibility in the Grand Caravan is very good. Standard equipment includes the mandatory dual front airbags and stability control; the Caravan's curtain airbags extend protection to all three rows of seats. The stability control system now includes trailer sway control, which applies anti-lock braking to selected wheels to correct against motions induced by towed vehicles. Only the Chrysler Town & Country has more standard and available infotainment features in minivans. The Grand Caravan may be one of the longest-running names in the minivan business, but the modern version is also one of the most technically advanced of its kind. Thanks to a series of infotainment additions over the past decade, the Grand Caravan has some technologies that just aren't available in other minivans, even for more money. The most affordable Grand Caravan is the "American Value Package" (AVP), priced from $19,995, with power mirrows, locks and windows; a removable second-row bench seat; fold-away third-row seating; air conditioning, cruise control; and keyless entry. At that price, it's less expensive than virtually every seven-seat crossover on the market, and it's more affordable than more than a handful of the five-passenger SUVs out there, too. The mid-grade minivans offer more standard and optional features, including a power liftgate, power sliding doors, and an upgrade audio system. The Crew edition gets a power driver seat, ambient interior lighting and satellite radio. There's also an R/T model that claims to be the sporty one in the bunch, with color-cued trim, black leather seats, and a special suspension and audio system. On the options list, the Grand Caravan lists some truly useful features that will be a boon for connected families. There's navigation; Bluetooth (either bundled with an upgraded radio, or an auto-dimming rearview mirror, or heated seats and steering wheel); the DVD entertainment system; and a power package for the side doors, tailgate and pedals on models where they're not included. Remote start and a 115-volt outlet wouldn't be left off either, not on such a high-functioning machine. Other features to check out are USB port for 3G dongles, that transforms the Grand Caravan into a WiFi hotspot. It's a no-brainer versus the more expensive DVD entertainment system, even if you spend for a couple of iPads. However, high-definition families might be swayed by a new Blu-Ray DVD entertainment system, offered on Crew and R/T models. It includes an HDMI input, a 115-volt outlet and two USB ports for gaming and recharging electronics. It sounds utilitarian, but think twice about ordering the new Stow 'N Place roof rails. It's possible, with all this interior room, that all of your stuff will fit inside the Grand Caravan. Rooftop storage bins cut into the coefficient of drag anyway, right? Very good gas mileage per passenger earns the Grand Caravan a decent score, though it lags well behind the Odyssey. The idea of performance in the world of minivans has to be taken in relative terms. As an eight-passenger vehicle, the Grand Caravan handles well and accelerates strongly–and earns average fuel economy for its class, too. It's not the fuel-economy leader in the segment, but it's grouped closely with the Toyota Sienna and Honda Odyssey. There's just one powertrain configuration available–the Pentastar 3.6-liter V-6 with six-speed automatic–and there's an "economizer" switch that adjusts shift timing to optimize gas mileage. There's no hybrid or diesel edition of the Grand Caravan, and with a replacement coming soon, no other powertrains are expected before that major model change. The end result? The Environmental Protection Agency (EPA) rates the 2014 Grand Caravan at 17 miles per gallon city, 25 miles per gallon highway. That's on par with the numbers generated by the Sienna, which loses its four-cylinder option for the 2014 model year, and for base versions of the Odyssey. 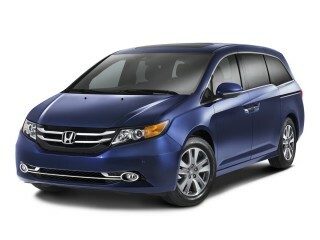 The Honda minivan leads the pack, with a six-speed automatic and gas mileage of up to 28 mpg highway. Our Caravan is just about exactly what we wanted it to be. Our Caravan is roomy enough to accommodate my wife who likes yard sales and big enough to carry groceries or a wide array of building supplies, and sturdy enough to carry the snow blower to the service man for... Our Caravan is roomy enough to accommodate my wife who likes yard sales and big enough to carry groceries or a wide array of building supplies, and sturdy enough to carry the snow blower to the service man for tune-ups and repairs. We find it attractive enough to be happy to drive it anywhere. And it has plenty of get up and go.